This page is for a guide we wrote before Google’s latest algorithm updates. Check out the most updated techniques to master roofing SEO in 2019. Sometimes it’s worthwhile to turn back the clock and see how SEO has evolved since 2011. There are many concepts that have translated over the decade and remain a vital part of optimization in the modern era. We are the original roofing SEO experts and have been helping contractors ascend to the top of Google for years. 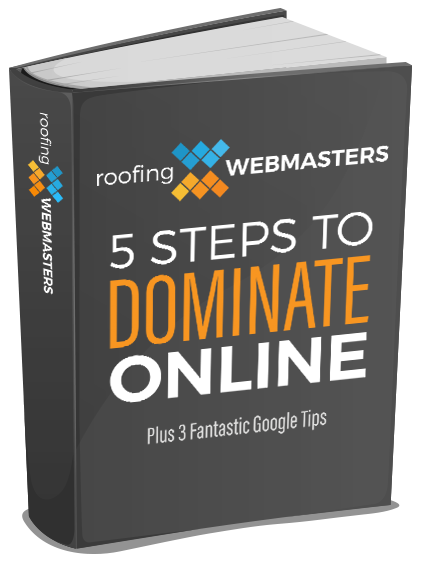 In this guide, you will discover 5 steps to dominate online. We also reveal 3 Google hacks to enhance your Maps placement. SEO is an acronym that stands for Search Engine Optimization. It refers to the steps it takes to push your website to the top of Search Engine Results Pages, often refereed to as SERPs. When someone uses Google they type what is known as a query into the search box. A query consists of one or more terms in which the user intends to discover information about. When a query is searched often, it becomes known as a keyword and competing websites battle to rank #1 for it. So what are these three results? And what do they mean for your business? Paid Ads are found on the very top of the SERPs and along the side. They are placed there because the client paid Google to list their company there. These are referred to as PPC or pay per click because each time someone clicks on the website link, the client is charged by Google for that click. Pay per click ads can be a great way to jump start your business, but they are not a good long term solution as they can quickly become very pricey. Some PPC ads cost as much as $60 per click or more! The place you need to dominate online are Map Listings and Organic Results. These listings are earned, not bought. They require hard work, skill and the implementation of the five steps found within this guide. Each and every one of these details matters greatly in your design. Just like a building gives a potential client a first impression about the place they are visiting, so your website provides a very important first impression to an internet user. Does your website design let your potential client know that you are a professional business? Or does it scream outdated and unkempt? Design is both an art and a science. It must be eye catching, but it also must follow the rules of Google. It needs to easily and quickly display important information to someone who lands on the page such as: who are you? Where are you located? How can they reach you? Did you know that the amount of time someone spends on your web page will play a huge role in factoring your ranking by Google? This idea is referred to as your “bounce rate.” Are people opening your website, not seeing what they want and quickly leaving? This is a bad sign to Google and will damage your rankings. But an eye catching website with easily navigated information will keep your audience on your page longer, leading to a much higher ranking for you on Google! Embedded in the design’s code are important clues to Google. Semantic mark-up for example tells Google what content within your design is important. It keys Google into things like your company name, address, phone number and hours of operation. Each detail of your code matters greatly in ranking high. Google even knows if your design is unique or it is simply a template. And unique designs are favored by Google. That is why our outstanding web team only ever creates brand new, unique designs for our clients. We know the importance of a specially crafted design. How long does your website take to load? Even this small detail plays a large role in the ranking of your website. Fast loading sites not only rank higher, but also convert leads better than a slow loading site. In today’s fast paced world, people rarely want to wait even seven seconds for a site to load. In fact, research over the years has shown that almost 50 percent of web users expect your site to load in less than two seconds. And 75 percent of consumers would rather visit a competitor’s site than wait on a slow loading page. But perhaps one of the most important factors in today’s world is the mobile friendliness of your website. Our team creates designs that are called “responsive designs.” A responsive web design can be viewed on any size device without losing any of your content or important information. It simply responds to the size of the device it is being viewed on and retains easy navigation. That means you can convert leads from mobile searches including phones, tablets, iPads and more! But even the best design will never be seen without pairing it with outstanding, optimized content. There is a saying in the world of SEO, “Content is king.” Content is one of the number one most important components of your online presence in determining your ranking. So what sets good content apart from bad? And what determines how Google will rank your content? Did you know? Google can tell if your content is copied from anywhere else on the web. And they will penalize both copied and duplicate content. They also place a large weight upon the depth of your content. Your website’s content should not be shallow, but should answer questions your readers might have while also providing relevant, unique ideas. The content needs to be authoritative and factually correct. The grammar must be impeccable and the copy free of spelling errors. And most importantly, you need your content to be optimized for important keywords. Keywords refer to the words people use to search for a service in their area, and when your content is written to target these keywords, you can garner new leads for a variety of services. You also need to submit a proper sitemap to Google so they can easily search and index your content. The architecture of your site also matters. For example, it is important to create content for top level pages and to silo pages of content under these top level pages which contain relevant sub category content. An example of this might be a top level Services page for your business with pages silo’d underneath the Services page that highlight and discuss specific services your business provides. By breaking your services into individual pages you increase your chance for picking up those specific keywords. Keep in mind though that each page must contain unique, in depth content. Because content is so vitally important to the success of your online presence, we employ an entire team of professional writers with an editor on staff to ensure our clients have extremely well written, unique content that targets each client’s specific local market. Map listings are by far one of the most important places to show up near the top. When someone is searching for your service in your city, you want to be quickly seen and easily located. Even if your clients do not generally visit your physical location, a map listing is a vital place to be noticed. Your Google map listing should be a top priority of your online presence. Setting up your Google listing can be done by visiting www.google.com/business. Once you have reached this web page you can either create a new listing, or work on an existing account. When you create a listing Google will need to verify your business, usually by sending a postcard to your physical address which has a verification code. In some cases, Google will simply call you to verify your business. Setting up your map listing is only the beginning. In order to improve your map listing rankings, you need to work on a large array of other components. For example, by increasing the number of citations you have across the web, you can improve the ranking Google gives you. You should also be sure that as you are creating these citations you establish a consistent NAP (Name, Address, Phone Number). Consistency means that if you say 1234 Road in one place, you say it that way in every place, instead of changing it to 1234 Rd or 1234 Rd. If you write your company name with a “&” symbol, use that symbol in every listing. Remember, you should never fabricate reviews, pay anyone to give you a beneficial review or steal reviews from other sites. Because map listings are so critical to your online success, we actually have a dedicated team that works on improving map listings through all of the above ways and more! If your map listing will not improve, talk to us about what may be holding you back. Do NOT miss out on this critical component of your online presence. Although social media may not be the first item that pops into your mind when you think about your online presence, it is actually an extremely important component of dominating online. And in fact, in an increasingly social world, no matter what your business is, you need to be found on all major social media outlets. Once you have these profiles set up, embellish them! Add photos to your galleries. Edit as much information as you can on your profile to ensure it is the most accurate possible. For example, add your phone number, hours of operation and services offered to your Facebook profile. Informational: This can be a fast fact about something related to your industry or a link to an interesting article, etc. Personalization: This should be a post that personalizes your company. You can use photos from jobs performed, or photos of your staff or even just fast facts about your company. The goal of this type of post is to help people see your company as human. Sales Pitch: You should include a post each week that promotes service, or has a call to action. For example, you could highlight an upcoming special you are running or post a coupon for a specific service. Maintaining your social media profiles can take a lot of work and a large investment of time. However, it is extremely vital to your chance of success online, so these items should not be neglected. We have members on our team who spend hours upon hours every week dedicated to ensuring our clients have top-notch social profiles. We post on behalf of our clients, constantly ensure their profiles are up to date with the latest relevant information and more. And all of these efforts band together to create an outstanding, well polished online presence. Your online presence is built upon hundreds of small building blocks. Each one is important in order to improve your overall presence. No detail can be forgotten. All of these tasks combined with the first four steps are what lead to an outstanding web presence. While there is a lot of labor intensive work to be performed, every component is important in aiding your online ranking. If you are tired of being beaten out by your competitors online and you have any questions about our services, please give us a call! We will be happy to assess your online web presence and help you pinpoint the best way to solve your ranking problems. Our clients rank on the first page of Google for countless keywords and you could be next! Read on for our three bonus Google tips! 1. Get Google reviews. We know you have heard this, but you simply will not do as well without reviews. This will help you show up on mapping as well as organic rankings. Working hard on your Google Search Console, Google Plus, Google My Business, Google Analytics etc… is a huge advantage, but without reviews, you simply will not show as well. 2. Take your business pictures of jobs etc… and upload them to your Google My Business account. Then, write one or two sentences about each picture and make them public. This will add to your knowledge graph, content and overall success of your Google account which improves your mapping and organic rankings. It also aids in Google liking you better which will result in more clicks and business for you. In conclusion, succeeding online is possible for any business, including yours! You no longer need to watch your competition dominate online. You can be the business who is seen first, gains the most clicks and ultimately receives the most calls. We hope this guide has been helpful and remember, our team is ready to help you dominate online! We can handle every single detail of your online web presence and by using our revolutionary tactics, we can help you dominate your competition. You can get started with us right away, today! We know you will never find an SEO company as talented, experienced and honest as ours. We don’t pull punches, which is why we have shared this helpful guide for free. We understand that the number one key to success is simply putting in the skilled hours of labor it takes to win! Contact us anytime to learn more or to put our team to work for you. If you simply don’t have the time, resources or skill set to handle all of this labor, then we are the team to call! We look forward to helping you beat your competition online! Download the free PDF of 5 Steps To Dominate Online. Updated on March 14, 2019 at 4:10 pm by Roofing Webmasters.